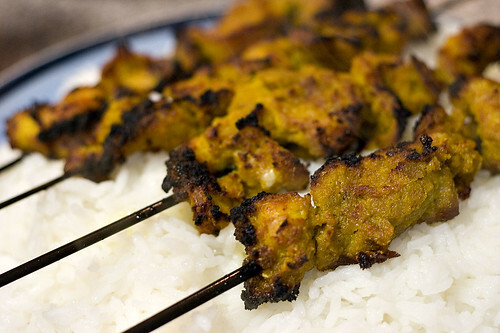 Chicken satay is one of my absolute favorite Thai appetizers! I order it just about every time I’m in a Thai restaurant or anywhere it’s served. I have never made it myself though! 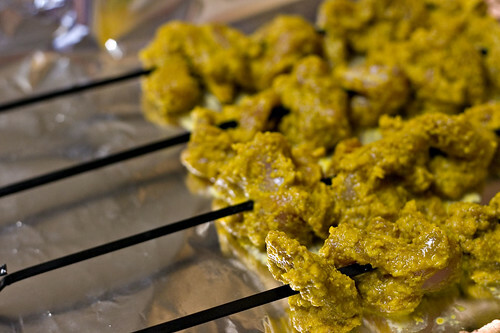 According to the cookbook, this is a Malaysian-style Chicken Satay which is sweeter than Indonesian. I’ve never ordered in a restaurant so I suppose we’re a bit opposite. You should try making it. It’s pretty easy as long as you can find the ingredients. I’ve been making chicken satay years. This sounds good except for the brown sugar. I serve it with hot peanut sauce. 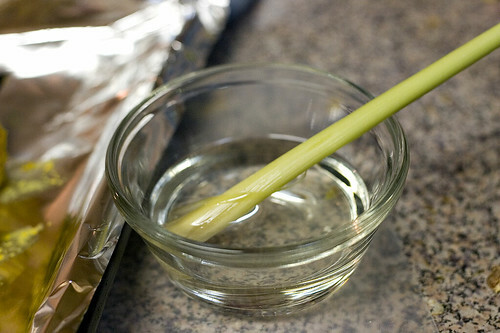 The recipe recommended palm sugar but I forgot to look for it. It had brown sugar as a suggested replacement. I might have to try it with hot peanut sauce next time. What goes into it? Oh, I love that cookbook! It necessitated a large shopping trip at an exotic grocery, but everything I’ve made out of it so far has been fabulous. Beware if you try any of the recipes that call for shrimp paste, though – it gives a great flavor, but it’s fantastically stinky. You can make a very passable peanut sauce for satay with peanut butter, soy sauce, some hot chile sauce and a bit of hot water or broth to dilute it. I may have to try the peanut sauce then. I doubt my wife would like it but she didn’t particularly enjoy the chicken. Any other recommendations from the cookbook? It’s hard to figure out what any of the dishes are like simply from the descriptions. I have an advance copy (what the library was doing with it I’ll never know) so there are no pictures and no page references. Hmmm, I know we’ve made a shrimp sambal out of the book, one of the satay recipes, the Celebration rice (yum), something with fish and coconut milk…they’ve all been nice, although the flavors are really different from other cuisines. I’ll be doing a post later this week on a couple of Indonesian dishes – the pix are up on my Flickr account now, if you want to see what they look like. Just the recipe I was looking for! This looks very authentic. I’m going to try it. I too forgot to buy boneless chicken thighs…oh well, I’ll have to debone them like you did! I am nervous to cook with fennel seeds, though. I have them, but I’m tempted to use cumin, anise, or caraway seeds instead. I guess I will take the plunge!